Dental crowns, also known as dental caps, help to conceal minor imperfections of your teeth. These may include discoloration, misalignment, chips, cracks, or a gap between teeth. Dental crowns also provide additional support for teeth that are weakened by tooth decay or a dental disease. However, in the past, dental crowns were made with metals, resin, or even wood. Porcelain crowns improve the appearance of your smile with a more natural look. If you need a root canal, placing a crown on the treated tooth after the procedure helps to prevent the possibility of further infection. Dental crowns can be made from metal, ceramic, stainless steel, resin, or porcelain. 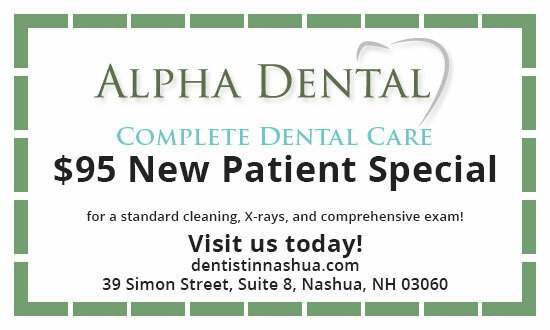 Dr. Ahmed at Alpha Dental in Nashua prefers to work with porcelain for several reasons, including better aesthetics. Dental crowns constructed of metal or steel are quite noticeable, even when they are placed over back teeth. This can make you feel hesitant to smile. The color and texture of porcelain, on the other hand, closely resembles tooth enamel. This means your crowns blend in better with the rest of your teeth. Dental crowns constructed of other materials feel different from your other teeth, which can become a minor annoyance after a while. Porcelain dental crowns are easy to mold and shape so they fit securely in your mouth. You may not even notice your porcelain crown after a brief period of adjustment because it feels so similar to the rest of your teeth. Another major benefit of using porcelain is that few patients are allergic to it, unlike metal and some of the other types of materials. New dental crowns may last up to two decades before you need to replace it as long as you take proper care of your teeth. It is strong enough to allow you to chew all types of food without having to be extra cautious. No special cleaning is required, making this tooth restoration option ideal for busy people who don’t want the hassle of having to clean a removable denture. Your dentist will take an impression that enables our dental lab to prepare your customized crown. Once it is ready, we will contact you to come in for a final fitting. The crown fits over the entire surface or chewing area of your tooth that is above the gum line. To ensure a proper fit, it may be necessary to remove a small amount of tooth enamel. Is a Porcelain Dental Crown Right for You? We offer several types of dental restorations at Alpha Dental in addition to porcelain crowns. If you’re interested in improving the appearance and functionality of a single tooth or several teeth, the first step is to schedule a consultation with Dr. Ahmed. After evaluating your teeth and learning more about your specific situation, your dentist will recommend a porcelain dental crown or another procedure.